Blanco Tequila, pressed lemon and a splash of passionfriut. Add eggwhite & shake hard. Strain and top with tonic water. Drink Añejo at room temperature or enjoy it with a few cubes of ice. Shake and strain into a tall glass-top with soda and a dash of Campari. 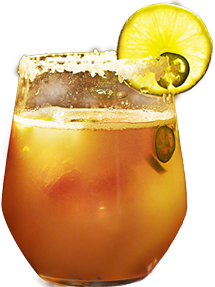 The red capsicum goes really well with the sweetness of the orange and adds a little spice with the tequila.